The Los Cristianos Valverde ferry route connects Tenerife with El Hierro. Currently there is just the 1 ferry company operating this ferry service, Naviera Armas. The crossing operates up to 7 times each week with sailing durations from around 2 hours 30 minutes. Los Cristianos Valverde sailing durations and frequency may vary from season to season so we’d advise doing a live check to get the most up to date information. Prices shown represent the average one way price paid by our customers. The most common booking on the Los Cristianos Valverde route is a car and 2 passengers. This is a modern, clean and efficient service. The only draw back is the small amount of deck space, if you want to be outside. The ferry takes up to 800 passengers. There were only 60 on board when we travelled, so ours would not be a typical experience. Very nice trip. I will use it. We were very pleased with the service on our trip from Los Cristianos to El Hierro though the crossing going over was a bit choppy. Boarding and disembarking were trouble free and the staff on board were very pleasant. 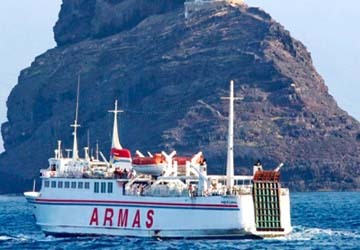 We used Armas on a trip to La Palma last year and were able to sit at tables outside on the deck which was very pleasant and we would have preferred to do this on the trip to El Hierro but this particular ferry did not have that option. 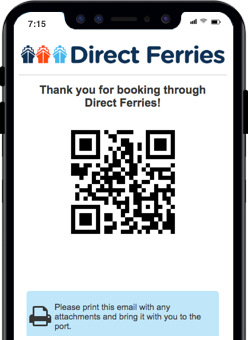 However, I would have no hesitation in using Armas Ferries on future occasions. "No issues at all and easy as it could be"
Had no issues at all on the crossing to El Hierro. All went to plan. Good job Naviera Armas. Perfect start and finish in hour.The interior could improve but overall good. Valverde is the capital of the island of El Hierro, in the Canary Islands, and is a fairly quiet city that is surrounded by beautiful countryside. The city is located on a mountain that is around 600 meters above sea level and is the only capital in the Canary Islands that does not have a coastal location. An important, and popular, attraction in the city is the Church of Santa Maria e la Concepcion which dates back to the 18th century. Contained within the church is an 18th century carving of the Virgin Mary and a Cristo de la Columna, a Genoese sculpture which is of great artistic interest. The City Hall faces the church and is a good example of typical canary Island architecture. Mocanal, in the north of the island, has abundant vegetation and an old settlement of stone straw-thatched houses called Pozo de las Calcosas, and is also site of two large natural swimming pools. One of the most important festivals held on the island is the Bajada de la Virgen de los Reyes. In this traditional festival, which is held every four years, the islanders carry their Virgin from her sanctuary to Valverde.